Much about math with multiple ages? Well, you might not think it’s much. Because we basically have two resources that have worked well for our students so far. Lil’ Buddy will start Saxon K next year. But I am sharing how we actually get math done with all the grades plus the natural progression in our homeschool. Also how living math gave us permission to incorporate some new ideas. This post contains my referral link, please see my disclosure policy. Since we started homeschooling our eldest, each of our children begins with Saxon Kindergarten. Saxon offers that spiraling approach and a wonderful grounding in the basic concepts. We do love our teddy bear counters! My eldest two worked through Saxon to middle school grades. That’s where we hit the struggles and the family was growing. Honestly, math got a little overwhelming once my older children reached middle school and I had a toddler and a baby. My children and I both needed help. That’s when Teaching Textbooks blessed us big time. For 4th grade and up we turn to Teaching Textbooks. 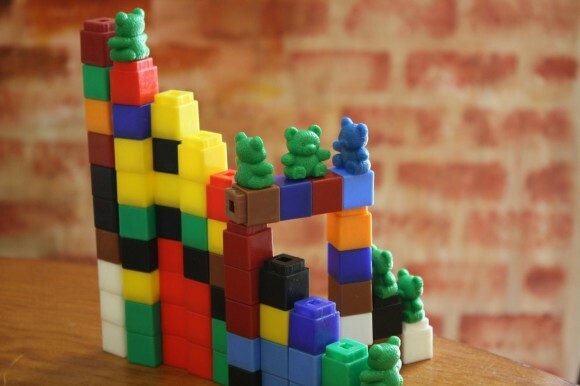 Preschoolers join in on whatever math might be going on at the time – especially teddy bear counters and linking cubes and manipulatives of all times. Plus it’s just fun to line some cars or trains up and slide and count. 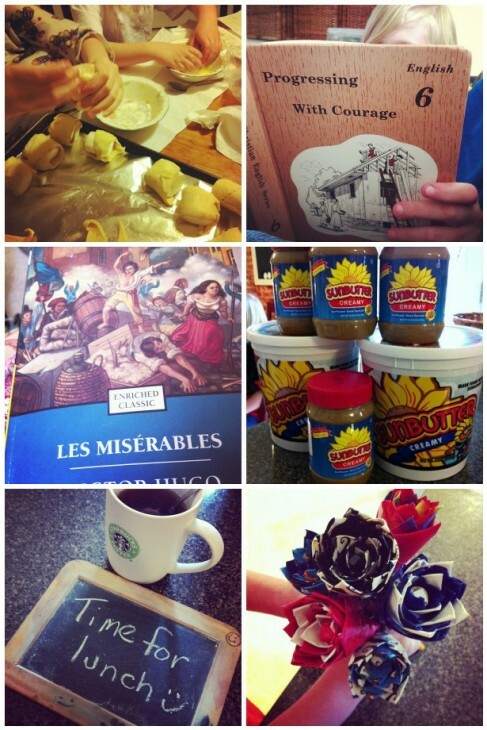 I’ve shared before a typical morning in Preschool to First Grade at Hodgepodge. We start with the little ones first. I usually sit between the two youngest and help each with their schoolwork. It works well to have all our supplies right there in the cubbies and to do many of the subjects together. Plus, right next to us, at the computer, one of the older three is working on a Teaching Textbooks lesson. So I am close by for any help. We’ve enjoyed grades 4th through (and working on completing) 9th with various children. Friends recommended Teaching Textbooks and am I ever grateful. Middle Girl saw her older brother and sister doing Teaching Textbooks every morning and asked to try the online placement test. So she started with Teaching Textbooks in 4th grade. If you are curious about Teaching Textbooks and if it might work for your child, you could try the free online placement test. **2016 Update: We have now used Teaching Textbooks 3rd grade through Algebra II. Pre-Calculus coming up this homeschool year! We love that there is a lecture at the start of each lesson. The children like the ‘buddy’ they can choose to cheer them on (a little animated character – an animal or creature of some sort). I love the automatic grading. I also like that my children with different learning styles can choose to simply use the curriculum two different ways – via the computer or with the book. And, they can also use both for reinforcement of a concept. We have used the Key To… series for problem areas. 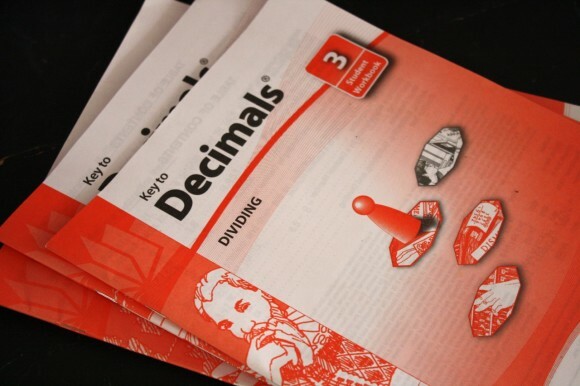 Both the Key To Fractions and Key to Decimals gave my older children the practice they needed to get over the hump during those middle school years. We have also used Big Brainz Timez Attack for multiplication practice. This program has expanded to include lower grades! More details in my Timez Attack review at Curriculum Choice. A Hodgepodge of Math: 1. Brothers play Connect Four | 2. Serious City offers counting practice with trains and cars | 3. 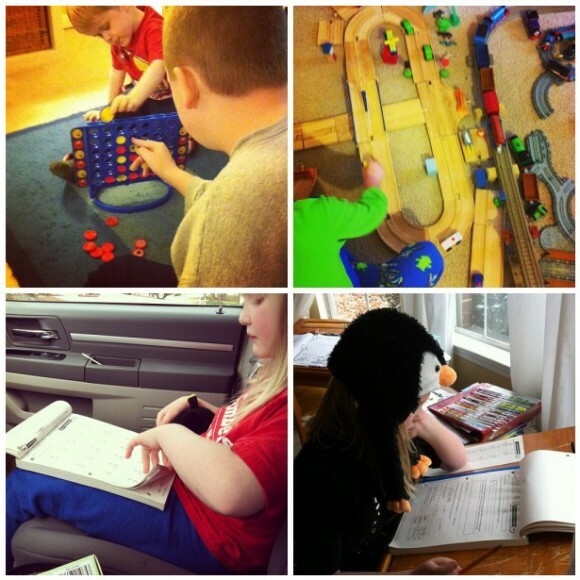 Math on the go – Saxon 1st grade in the van while sisters are at piano lesson | 4. A thinking cap often helps with math. With three using Teaching Textbooks, they each take a turn at the computer. What’s nice is I am right nearby, usually helping first grader with her math, while one of the children is listening to the lecture and working through problems. There’s the chalkboard desk for working problems out. 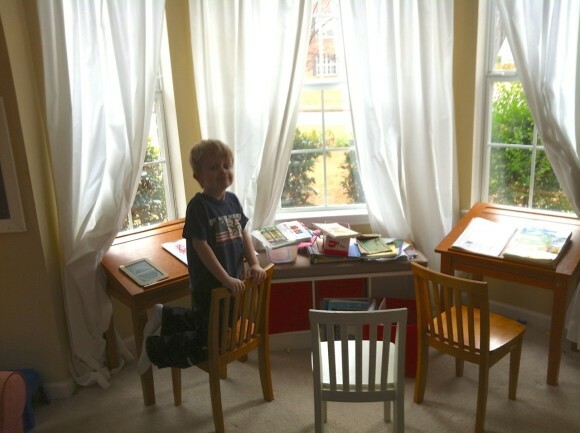 (Take a tour of our homeschool room to get the big picture). 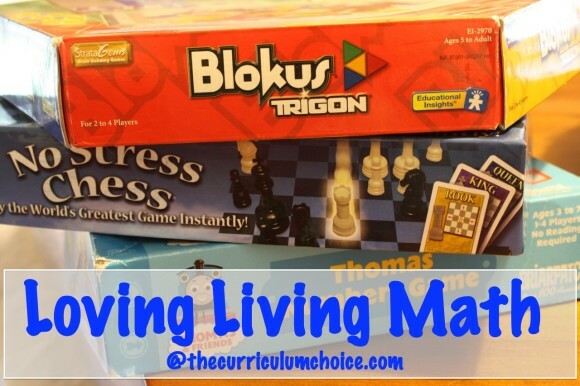 A fun, everyday way to practice math every day is with living math. More living math ideas on Cindy’s Living Math Pinterest board. A list of living math books at Heart of the Matter. 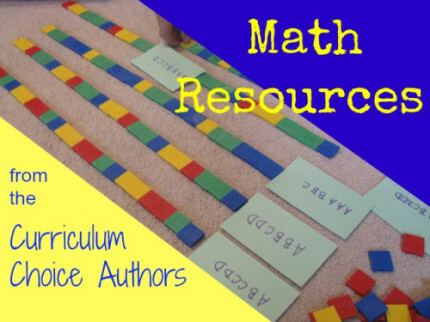 Just shared yesterday – it’s an ultimate, awesome list of Math Resources by Curriculum Choice authors. Also this week: Making resurrection rolls on Easter morning. A wonderful visual! | 2. 5th grader pulled out the next English book – not sure I am ready for her to be a 6th grader! | 3. Watching the movie had Eldest Girl singing all the songs and pulling out the book to read. | 4. Thanks to Nana – that’s a whole lotta SunButter!! (have you read my Simple Guide to Nut and Egg Allergies?) | 5. Hot tea and the little slate are friends to the homeschool mama with laryngitis | 6. A bouquet of duct tape flowers! Middle Girl promises a duct tape tutorial. –> If you are interested in more with multiple ages, I have a series going on! Science, writing, nature study and more! What math curriculum and resources work best for your different learners? HSLDA: Free Membership for Parents of Preschoolers! I loved the thinking hat….and the duct tape roses. Feel better soon! This is a great post. I remember trying to balance the different ages in math. It is not easy, but we utilized Saxon Dive DVDs and Teaching Textbooks to make it happen. We did a mix of Saxon and Teaching Textbooks and my boys are confident with math as high schoolers….so grateful for both approaches! Me too Barb! And it makes me feel good to know knowing that you and your boys used this route too! I am homeschooling my fourth grader. We are using Saxson but my son is getting tired of my poor math skill’s plus with homeschooling my 5 year old twins next year I will need all the help I can get. So to Teaching Textbooks we turn. We have Cindy’s Loving Living Math but I have not even finished reading or incorporated any of her great ideas – yet. Still treading water right now but maybe soon! My daughter uses a spiral curriculum too, and I LOVE it! 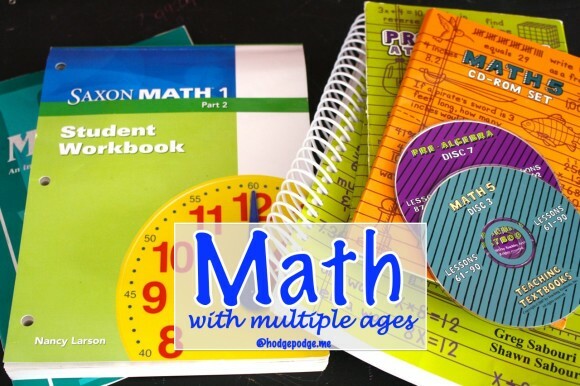 Thanks for taking the time to share how math works in your homeschool. It’s always good to see how others manage it all. Tricia – I just love how you so naturally incorporate math, and all of the resources you have outlined here. 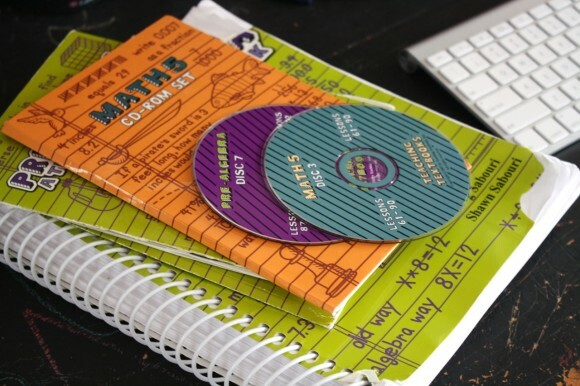 This is a great post for someone who needs to know ANYTHING about homeschooling ANY AGE with math resources. We love Saxon here. I have heard so many good things about TT, but since Classical Conversations uses Saxon for the upper grades (and the kids will have access to a tutor because I stink at math!) we are sticking with it. I say do whatever works for your children, which is obviously your approach. I’m so glad to hear more positive things about Teaching Textbooks. I think I’m making the switch for most of my children next year! I’ve heard all good things, and it seems to be just what we need.